I would only recommend my friends to watch it when it comes out on Blu-ray or if they can get tickets cheap (Orange Wednesday perhaps). I am not a huge fan of Tim Burton as I feel he churns out the same oddity in each of his films, crazy curly trees, same old music from Danny "hah hah" Elfman and predictably starring Johnny Depp and his wife, Helena Bonham Carter. Enough already. Just didnt make any sense. I have mixed feelings about this film. The plot has nothing at all to do with the original Alice in Wonderland books and is frankly a bit thin. Although the individual performances were actually pretty good, the lack of a decent storyline meant that they didn't work together. There is obviously a fair amount of weirdness in the film and it is surprisingly scary in places so don't take young kids to it. I think it was boring really because i thought it was just the same as the old one so really its the same film but bit diffrent.I think if you want a DVD of it think againg because you will notice that it is just the same! Just a waste of money!!!!! Tim Burton's Alice in Wonderland, was, well, pretty good actually. I wasn't sure what to expect, and can only vaguely remember the story from the original book, but all in all, an enjoyable watch. A typical Burton movie, with a few edgy dark undertones running throughout. The Mad Hatter for me, played by Johnny Depp proved to be my favourite character, although getting a little creepy at times. The red queen played by Helena Bonham Carter came a close second! my recient trip to see the new version of alice in wonderland wasnt as good as i thought it would be. Tim Burtons remake of the childrens classic was dark with the use of deep bold colours. Tim has used some top of the range actors and actresses, but unfortunately i dont think he has used them to there full capability. Kind of weird and whacky this film - as you'd expect I guess from Tim Burton - but actually surprisingly enjoyable. I hadn't read huge amounts about it before I went, but I'm not a massive Tim Burton fan so wasn't expecting that much, but I was pleasantly surprised. 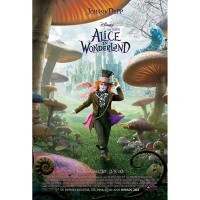 It appears to have absolutely nothing to do with Alice in Wonderland, other than the fact that the characters are the same, but as a standalone film (ie forget the original) its a pretty good watch. Wow, what an incredible film if not purely for the visual effects and atmosphere. No doubt, the storyline itself was slightly lacking - by the end I did feel there was something missing. The 'climax' of the film is short lived and leaves a sort of emptiness. My Wife & I watched the SKY/3D Regional private 'Premiere' screening last night of Disney's 'Alice in Wonderland' at the Xscape Cinema Complex in Milton Keynes. I couldn't agree more with this reviewer. I enjoyed avatar much much more. Although I really liked this film. It could have been as successful without the 3rd dimension.